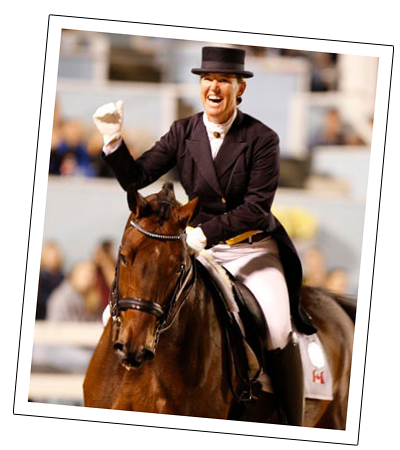 Two time Olympian-2008 and 2012- Jacqueline Brooks has been a dressage competitor, trainer and coach for more than 20 years. During that time, she has qualified for six Canadian Teams- 1 PanAm (Team Silver Medal), 1 WEG, 2 World Cup, and 2 Olympic - on two different horses, Gran Gesto and D-Niro. As well, she has trained more than 15 dressage horses to Grand Prix and is an Equine Canada certified Competition Coach Specialist who has helped numerous young riders and adult competitors of all equestrian disciplines achieve success in the ring. Jacquie is the Head Trainer at Brookhaven Dressage, located just outside of Newmarket Ontario, which she owns and operates in partnership with her parents and biggest fans, Eric and Mary. There she welcomes clients in full or partial training and ship-ins for single lessons or short term stays. As well, Jacquie can be found quite often as a a guest clinician all across North America sharing her expertise,experience, and encouraging teaching style with riders and their horses. After graduating from the University of Western Ontario in 1990, Jacqueline Brooks attended the Pan Am Games in Havana, Cuba as a groom for Canadian Ashley Holzer. This experience became the determining factor in her choice of an equestrian career. The following year, Finnegan, an Oldenburg gelding, was purchased by Brooks and her family in Germany as a two year old. The duo would later go on to compete in the Swarovski Canadian League World Cup Final in 2002 and 2003. In 2002, Brooks won individual Gold at the Prix St. Georges Derby at the CDI3* in Sydney, Australia, and with her teammate won a Silver Medal in that CDI Invitational. With her 2003 Pan American Games team silver medal mount Gran Gesto, an Oldenburg gelding owned in partnership by Eric and Mary Brooks (Brinc Ltd.) and Anne Welch, Brooks enjoyed considerable success starting with their Grand Prix debut in early 2004 which qualified them for the Canadian Olympic Trials. Second and third placings in 2005 CDI3*s (Ottawa and Toronto) provided the pair with qualifying scores for the Canadian League World Cup Final where they finished in 3rd place. Earlier in October that year, Brooks and her young horse, Balmoral, repeated their victory in the North American Breeders Futurity - this time as a 6 year old - at Dressage at Devon in Pennsylvania. 2006 began in Florida where Brooks competed regularly on the Florida circuit finding successes with both horses: Gran Gesto in the Large Tour and introducing her young horse, Balmoral, to the Small Tour. Brooks and Gran Gesto earned a place on Canada's World Equestrian Games team and traveled to Europe for preparatory training and competition. They enjoyed impressive results competing in lead-up competitions including second place in the Freestyle at CDI3*Pompadour, France. Brooks and Balmoral returned to Canada to put in a great show at the prestigious Dressage at Devon CDI3* where they came 2nd in the Intermediaire I and won the Intermediaire Freestyle. That year Brooks was named the inaugural recipient of the annual John Perry Memorial Award for outstanding sportsmanship exhibited by a performance sport athlete. In April 2007, Jacqueline & Gran Gesto were awarded a ‘wild card’ from the FEI to represent Canada at the World Cup Finals. This was the first appearance for Brooks at the World Cup Finals after a number of years placing at the Canadian World Cup League Finals. Jacqueline and Gran Gesto were named to the 2008 Olympic Games Canadian Dressage Team after an impressive winter competition season in Florida with a win in the Palm Beach Derby CDI-W Grand Prix Speciale and a double second place behind team mate Ashley Holzer at the Wellington CDI3*. After a successful Olympics for the Canadian Dressage Team, Jacqueline returned to Devon with Balmoral where they won the Grand Prix and were second in the GP Freestyle. Early the next year she sold Balmoral and continued to compete successfully at Grand Prix with Gran Gesto as she began to search for a new younger horse to train to Grand Prix. In March 2011, D Niro a Swedish Warmblood (D Day by Alitalia) came into her life. At Dressage @ Devon 2011, D Niro won his first ever competition in the CDI Grand Prix Speciale encouraging Jacqueline to declare him as a possible contender for London 2012. At almost 17 years of age, Gran Gesto continued to train and compete at Grand Prix and during the summer of 2011 won the Grand Prix Freestyle at all three Canadian CDIs. In January 2012 Jacqueline and her horses went to Florida for further training and competition. Between January and June, D Niro's scores consistently improved culminating with two firsts at CDI Blainville, the last Canadian qualifying competition for nomination for London 2012 and Jacqueline's second Olympic Games. While in England, Jacqueline and D Niro prepared for the 2012 Games by successfully competing at Hartpury, followed by on excellent showing in London. Before and during the London Olympics Jacqueline brought more than 5000 friends along with her by posting pictures and updates on her facebook page which can always be accessed from this website. Jacquie continued this practice of sharing her adventures with D Niro (Goose) on facebook throughout the 2012/2013 season during which she and Goose won the Freestyle at Dressage @ Devon at the end of September, followed by several successful competitions in Florida where they were able to secure second place in the North American World Cup League. This led to competing in April in Gothenborg Sweden at the 2013 World Cup. Again Jacquie took 5000 friends and more than 500 subscribers along on her facebook page.